In the afternoon, the old American ex-pats of San Miguel, most from Texas or California, bask in the Jardín like lizards. There is a natural seating order along the green wrought-iron benches. No one sits in the first row facing the church, La Parroquia. Not in the afternoon when the sun hovers over its tallest spires, shining hotly in your face. In the second row, beneath the cool shade of the laurel trees, are the clusters of old men glancing at the local paper, Atención, or working on crossword puzzles or smoking a cigarette while silently watching the scene around them. Their wives or girlfriends come and go, one off to look at the silver and turquoise bracelets at the joyerias on San Francisco, another to go pick up Sin-Bac at the Farmacia Aurora. 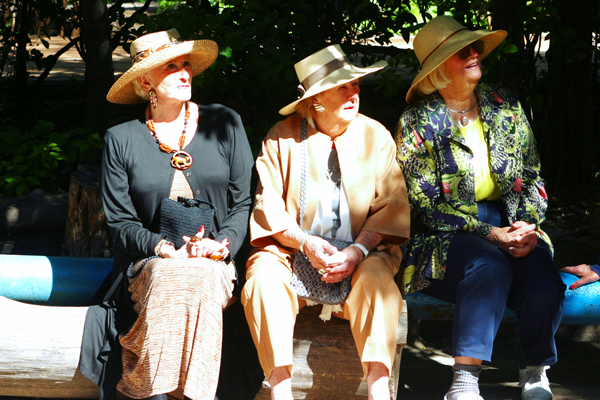 Women waiting in the Jardin. Photos by David Lansing. When the women are done running their errands, they come back to the benches and debate with their husbands whether they are hungry enough at this early hour in the afternoon to get something to eat and, if so, whether they feel like comida at Posada Carmina or a sandwich at Pegaso or just a bowl of crema de poblano somewhere. The uniformed school children passing through the jardín on their way home for their own comida stop at the green carts with the vinyl Coca-Cola covers and buy Fantas or chicharrones, doused in hot sauce, or bags of jicama sticks spiced up with a squirt of picante sauce and vinegar. Photos copyright by David Lansing. 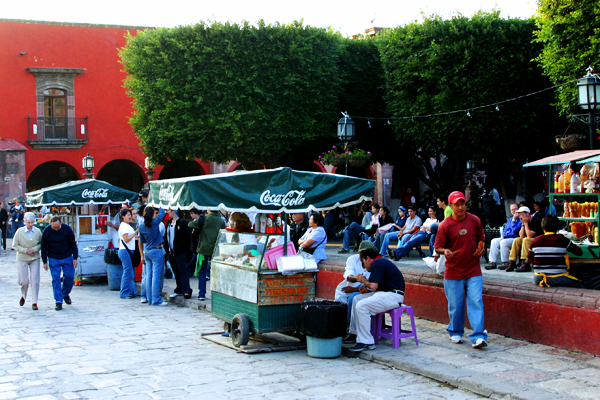 In the inner rows of the jardín, around the bandstand, sit the locals, the young working couples eating sandwiches, the old men wearing ranchera hats having their shoes shined, the women nursing babies, a rebozo over the child’s face, the grandmothers giving toddlers bits of churros to feed the dozens of pigeons. Always changing; always the same. Oh by the way..I wanted to tell you …I have enjoyed the journey’s through your words. And I am mentally filing all the places to see and do…Thank you. Thanks Sonia. More to come! We’ve got Day of the Dead coming up this weekend and the town is getting ready for all the strange events.